Turkey is often the center of the harvest feast we call Thanksgiving. A time invested and family honored tradition in many North American households that has become synonymous with the festive season. Family gathered around the table, a roasted turkey at its centre, golden brown and dripping with juices awaiting the sharpened carving knife. Its presence is expectation and nostalgia wrapped into one, like a scene from a Rockwell painting. Many of us have learned the hard way not to tamper too much with tradition. With so many new and amazing flavours being introduced to our collective palate every year, how do we introduce something new to our festive celebrations? Fall offers us much in the way of produce and flavour. The trick is learning to stretch in a new direction with those dishes that accompany your big bird, without straying too far afield. Beg for the recipe you enjoyed at your favorite local eatery. Borrow from food trends. Steal traditional dishes from other cultures and climates. I often find inspiration when dining out. You’d be surprised how often a chef will share a recipe or at the very least, a list of ingredients, if you ask. Food trends often push our tastes in new directions. You might not be ready for Tofurky (Tofu Turkey), but a move in a direction that favors Mediterranean freshness or Moroccan seasoning might be a welcome change. Try a fresh new condiment like Cranberry with Orange, Figs & Mustard Seed or Citrus Pomegranate Relish. Thanksgiving is celebrated across North America, north to south, east to west with traditional foods varying in taste and ingredients. In the southern United States no home cook would think of leaving the table void of cornbread, or at the very least, cornbread stuffing. Another southern favourite – Swiss Char with Bacon & Hot Sauce – is truly worth the effort. The more northern our table, the more there is a reliance on roots and tubers; roasted, mashed or glazed. Add fresh herbs and sour cream to roasted potatoes or carrots, and finish with a squeeze of lime, a drizzle of chili oil and a splash of fresh cilantro. Think about a balanced table in both colour and texture. Consider complimenting flavours; salty, sweet, acidic, earthy, creamy, spicy or smoky. 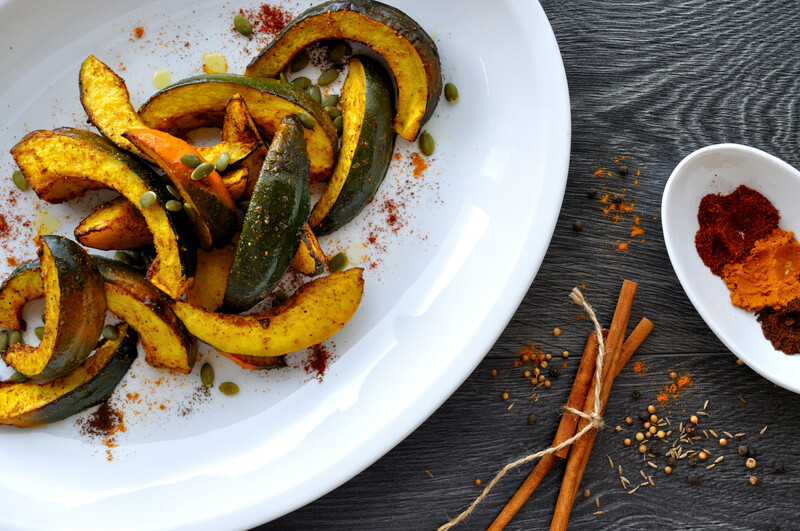 For this month’s Spiced Acorn Squash recipe we borrow seasoning that accents some of our sweet autumn favorites and swing them to the savory side of the kitchen. The result is a taste that has all the warmth and familiarity of a conventional side dish without tampering too much with tradition. Because nobody wants tears over turkey! Our Moroccan spice mixture is one of the most versatile spice blends we make in the Epicuria kitchen. 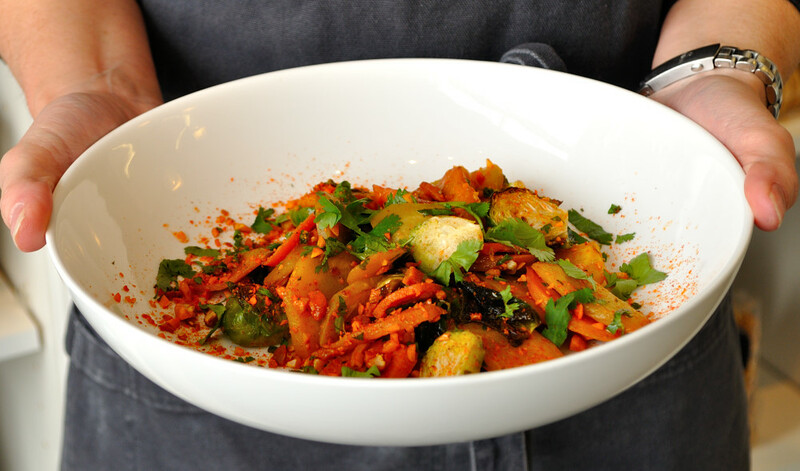 Not only do we use it in our neighborhood favourite Lamb Tagine, we adore it on chicken, salmon and vegetables. 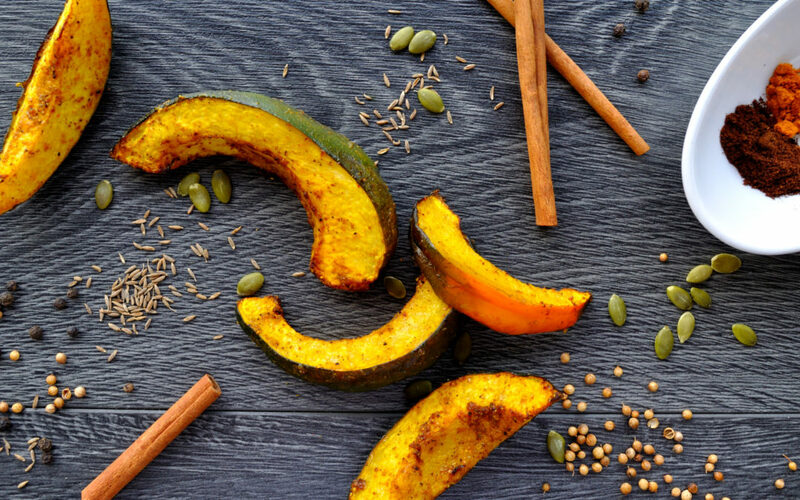 We love how it marries with the sweetness of fall squash and other flavour accents we might add such as pumpkin seeds, dried fruit, or even sesame. This recipe works for a quick weeknight side dish, a festive platter on a celebration buffet or an addition to your vegetarian eggs benedict at brunch. Cut the squash into one-inch wedges lengthwise. Toss with a generous drizzle of olive oil, salt and spice mixture. Roast at 375⁰F for 25-35 minutes or until tender. Garnish with toasted pumpkin or sesame seeds. Mix well. Store extra spice mixture in an airtight container. Use frequently.